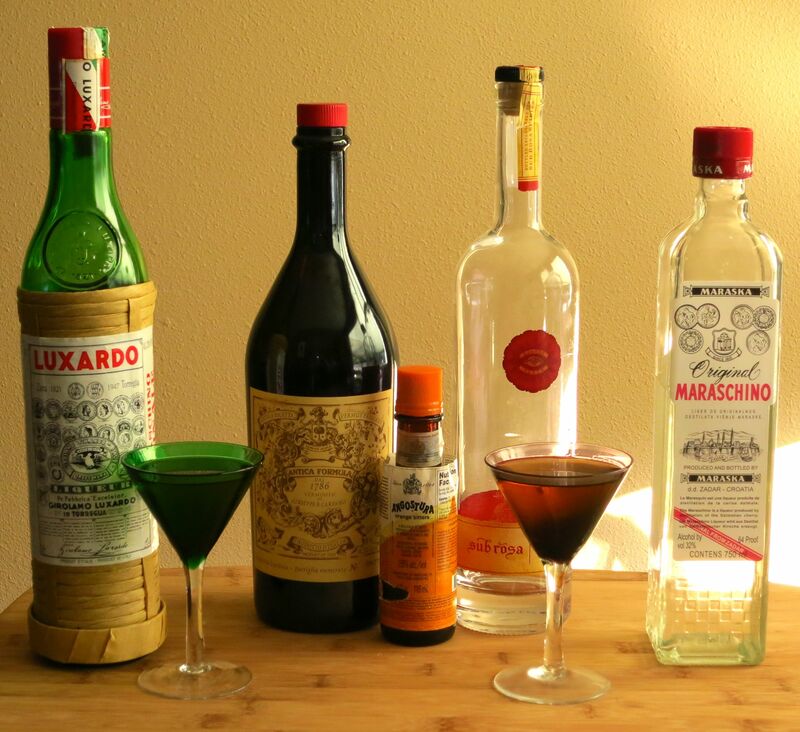 This week we decided to do a comparison between the two maraschino liqueurs we currently have in the liquor cabinet. Maraschino is a cherry-almond liqueur used in many classic drinks, and we’re both fond of it for it’s complex, somewhat bitter fruit/nut flavors. 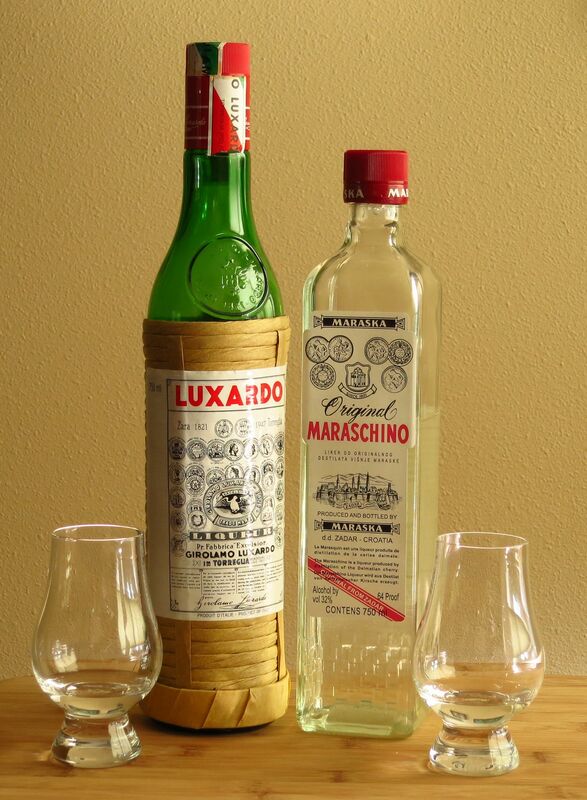 Luxardo is an old stand by in our cabinet, and we picked up the Maraska not too long ago as well to give ourselves options. Which we’re all about :). We were curious how they compared, both straight and in cocktails. Read on to see what we discovered. We started off by tasting the maraschinos side by side. Nose: Bitter almond, cherry, bitter green herbal notes, stone fruit pits. Palate: Very sweet and viscous. Sharp green bitter start, then toasted almonds and cherry stones. Slightly spicy, cinnamon-y finish. Nose: More subtle nose. Sweet almond, cooked cherry, subtle cedar wood. Palate: Very mild bitterness relative to Luxardo. Cinnamon, cloves, and cooked cherries at the front. Rich creamy almond and a hint of cedar after that. Long tingly finish with cloves and licorice root. 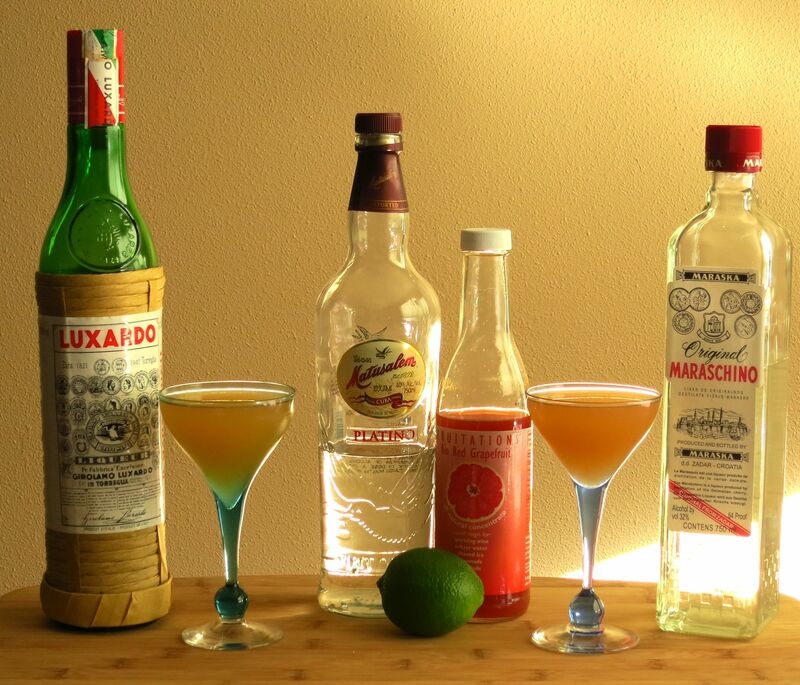 We decided to do a classic for our first comparison, the Hemingway daiquiri. The grapefruit and maraschino add some complexity to an already famously delicious drink. *When we don’t happen to have fresh grapefruit in the house, we use Fruitations grapefruit concentrate. It’s very fresh-tasting and not overly sweet, and makes a great substitute. Nose: Grapefruit, lime, vanilla, cherry-almond from the maraschino. Palate: Very tart, bitter, perfume-y lime underpinned by grapefruit and toasted almond. Mellows in the mid-palate with sweetness and vanilla from the rum. Long bitter finish starting at the end of the mid-palate, along with a little bit of burnt sugar a la flan sauce. Toasted almond and fruit pit flavors really stand out when compared side-by-side with the Maraska. Nose: Acidic lime, cherry pie and a little bit of sweet almond. Less grapefruit and no vanilla compared to the Luxardo. Palate: Citrus blossom & grapefruit to start. Sweet cooked cherry and creamy almond into the mid-palate. Big punch of lime starting at the mid-palate into the finish. Lime punch even more noticeable compared directly to the Luxardo. Rum is much more subdued, less vanilla notes. Less bitter overall. Nose: Saffron, woody vanilla, bitter almond and bitter green herbal notes. Palate: Bitter almond, saffron, vanilla to open. Almond, orange peel and a really sharp green bitter bite on the mid-palate. Toasty, woody vanilla as well as tingly spicy notes on the finish. The spiciness is interesting seen as the Maraska had that when tasted alone. Nose: Muted saffron, orange peel. Cooked berries, cooked peach or apricot. Woody vanilla too but muted. Palate: Coffee and root beer at the front. Orange bitters at the beginning of the finish, then almond, cooked peaches/cherries, and a little bit of saffron. Woody Carpano notes to finish. Both maraschinos are tasty but quite distinct. The Luxardo adds more bitterness and almond flavors, along with cherry pit flavors as opposed to the flesh. The Maraska adds a lot of cherry fruit flavors along with the almond, and is substantially less bitter. It is also creamier, spicier, and a little less sweet. We encourage you to play with them both and see what you like, since as you can see above, which one you choose to use can substantially impact the flavor profile of the drink. This entry was posted in maraschino, rum, saffron vodka, white rum and tagged ab fab cocktail recipe, fruitations, Hemingway daiquiri cocktail recipe, matusalem rum, sub rosa saffron vodka. Bookmark the permalink. Nice review. You should consider reviewing the Leopold maraschino liqueur next!